There’s no magic word count to land on the first page of Google. Doesn’t Hubspot say “the sweet spot” for ranking on Google is 2,250-2,500 words? And don’t countless other SEO experts say your post should be around 2,000 words, 2,500 words, or 3,000 words? Most experts cite a Serpiq study that claims the average length of posts that rank #1 in Google is 2,450 words. Yes. They do. But it’s not that simple. Depending on the quantity and quality of data and the industries it comes from, you’re going to find all kinds of conflicting answers. That’s why Rand Fishkin cautions bloggers to be skeptical about prescriptive blog post lengths. It’s easy to assume that data gives us objective answers, but unless that data is isolated to your niche, your audience, your keywords, and your goals, it isn’t as helpful as it appears. Depending on the keywords you’re targeting, a 2,500 word post might be excessive, and less helpful than a concise 1,000 word post. Or if your topic is really complex, 2,500 words might barely scratch the surface of what someone is looking for. After studying 2 million keywords, Ahrefs (makers of our favorite SEO tool) found that a page’s age may have a bigger impact on it’s rank than word count. 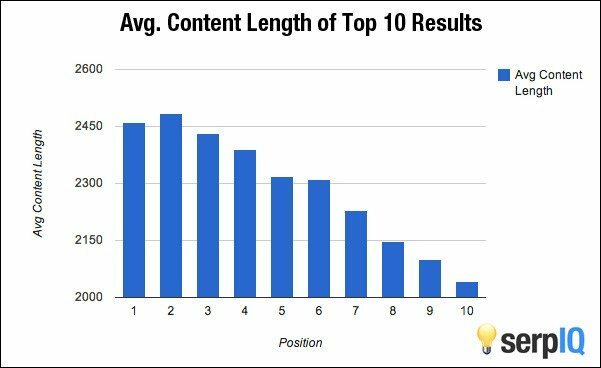 In that same study, they found that the median length of pages that rank #1 on Google was 800 words–significantly shorter than what most SEOs recommend. Remember that Serpiq study everyone cites? They studied about 20,000 keywords. Ahrefs studied 100 times more than that. Even with all that data, Ahrefs supports Rand Fishkin’s conclusion that great content does not equal long content. So why does Overthink Group still recommend you write “long” posts if you want to rank? Long posts are not inherently better. But a short post is also much easier to knock out of a #1 spot. When I see a post under 2,000 words sitting on the first page of Google, I know that I can probably cover that topic more comprehensively without adding fluff. And that means my post will probably become a more helpful result than some 500 word squirt. Longer posts also have the potential to rank for more related long-tail keywords, which account for about 40 percent of all search traffic. And as you rank for more related long-tail keywords, that clues Google in that your post is a good resource for those shorter, more valuable keywords. Sometimes when a short post outranks longer posts, it’s because the longer posts are poorly organized, or they take the topic in a really specific (and unhelpful) direction. Or their website is just plain atrocious (slow, unreadable on mobile phones, not secure—take your pick). But that doesn’t mean that you should write a short post about that topic in order to rank. With a little research, you can find huge content gaps that the short post simply doesn’t address, and organize the missing information in a way that provides a better experience. Google uses more than 200 factors to help people find what they’re looking for, and a lot of them can be connected to content length. If someone spends a long time on your page, for example, that tells Google that your page was probably a helpful result. But there’s only so much time you can spend on a 500 word post. Bottom line: keywords are more poachable if the main competition is short. At Overthink Group, we generally stick to the 2,500+ word guideline, but it depends on the keyword. That’s because with good outlining (which you should do if you want to rank) you can write 2,500 words about pretty much anything.